Ambassador Martha Campbell retired from the Foreign Service in August of 2012, finishing out her career in the Republic of the Marshall Islands. Ambassador Campbell agreed to this informal and rather unusual exit interview about her life as a Foreign Service Officer. The interview contains questions about past posts, favorite foods, what it is like to be a woman in the Foreign Service, advice for officers and family members, and more. This interactive PDF I created is best seen with the most recent version Adobe Reader; you can receive a free software update on Adobe's website. Reader 10.1.4 is preferred. It is also best viewed in Full Screen Mode. Posted August 25, 2012: 9 pages, interactive interview with audio clips. ________ had soft eyes, a strong, brown body, multiple scars on her legs from scrapes and bug bites, a white t-shirt and some black shorts, and an easy smile. I met her at a girls’ camp in 2012 out in Ajeltake. 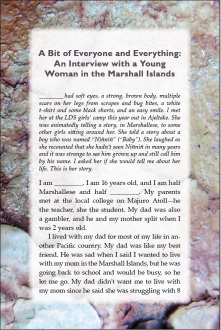 She was animatedly telling a story, in Marshallese, to some other girls sitting around her. She told a story about a boy who was named “Niñniñ” (“Baby”). She laughed as she recounted that she hadn’t seen Niñniñ in many years and it was strange to see him grown up and still call him by his name. I asked her if she would tell me about her life. This is her story. Posted August 9, 2012: 5 short pages, non-fiction; if you are unable to download it, you can find it copied on a blog post here.